No one wants to think about the worst happening. We often push off planning for disasters because we either can’t bare to think about it or do not think it could ever happen to us. For some, we might not know where to start. I do not intend for this post to be a fear-mongering post at all. It is to help you to be prepared and help you to have a plan in place in case a home fire happens in your house. The Red Cross reported that 93% of disasters they responded to were fire related. You need a plan. A real plan. “I will just save the kids” is not a plan. Many fathers like to say this. Many mothers are sure they would save their children. But what if one of you isn’t there? What if something happens to you? What if there is no way for you to get to the child? The plan needs to be something that any child capable of being independent can take ownership of and do it themselves. If a parent couldn’t get to the child for whatever reason, the child needs to be able to save him/her self (provided the child is able to do so). 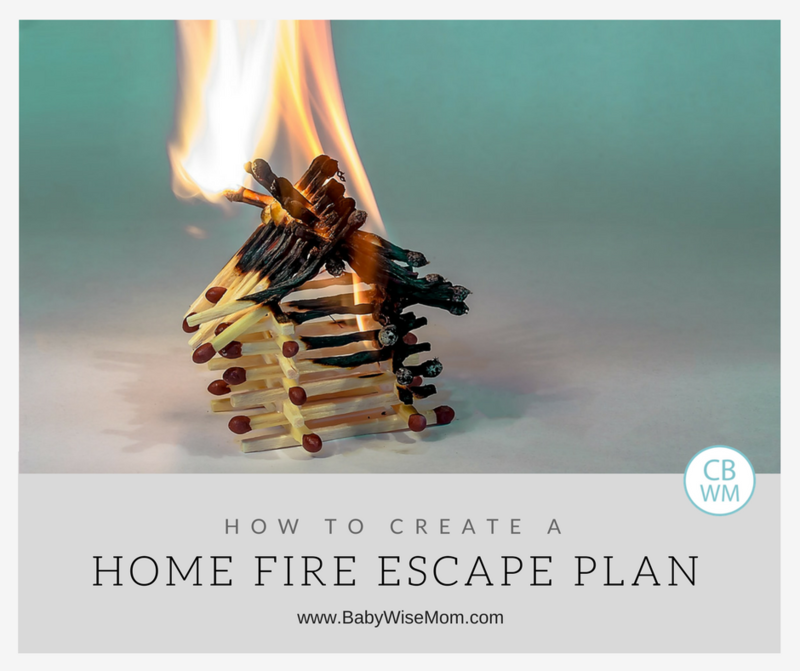 The plan needs to be concrete–an actual route that will be taken if there is a fire. There are obviously ages that babies and young children cannot do anything for themselves. In those cases, it would be a parent. Have a plan for who does goes to the child who needs help, but have a contingency plan for if one parent is unable to get there for whatever reason. In our plan, we have two ways to escape from each room. We have a way from the bedroom to the nearest door. We also have a way through the window in case the easier path, out the door, is blocked. We focus heavily on what to do if there is a fire at night during sleeping hours because that is when the child is alone. Night is also when the most deaths from fire happen, which make sense. We will also discuss ways to get out of the house if they are in different parts of the house. Most home fires occur in the evening, not during the middle of the night. We have a meeting place in the front yard and a meeting place in the back yard. Once you are out of the house, you want a place for everyone to gather so you can do a head count and know who is missing and who is accounted for. You also don’t want your child wandering close to the house looking for you. Once you have a plan set, pick a day to practice the plan. We practice our plan twice a year; once in the spring and once in the fall. The timing isn’t important–just make sure the practice happens a couple of times a year. This keeps the plan in in the mind and allows you to adjust as your children age. We talk about not trying to pack things up or take things with them. We explain that material things can be replaced and that they need to get outside as fast as possible. We teach our children to lightly touch the door knob before opening any door; that way if it is hot, they won’t burn their entire hand by grabbing the knob. Also, if it is too hot, it is wise to go to the widow option (or second exit option). If the way is blocked, they need to shut their door and leave it closed. We teach them to open the door while on their knees. Smoke rises, so it is good to be on the ground so you can stay below the smoke level. They then follow the designated path to the nearest door. If that path is blocked, they return to the bedroom and go out the window. Once the child is outside, he/she goes to the meeting spot. Once we have talked through those things, we practice it. It is valuable to physically go through the process to help solidify the plan. 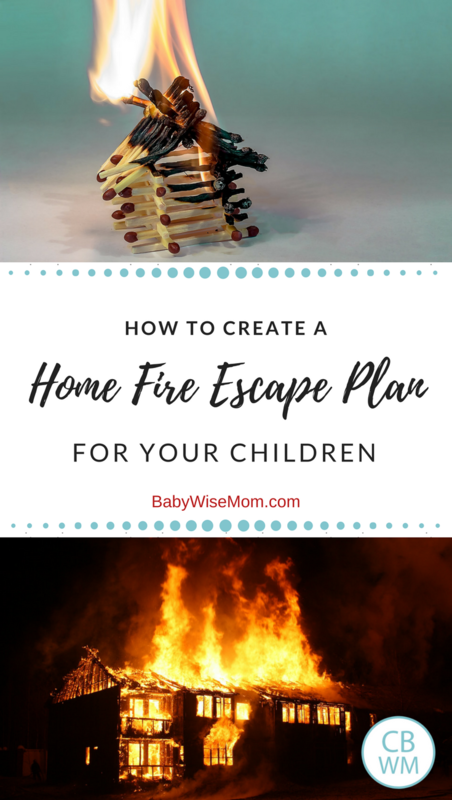 If a fire happens, you want your child capable and confident. It also helps you to see if your plan in your head will actually work. If your plan includes your child opening a window, you want to make sure your child is capable of opening the window. If your child can’t get out a window for any reason, opening a window and calling through it can let rescue workers know where to go to save them. The best preparation is prevention. Fires typically start in kitchens or at heat sources, so be vigilant with keeping those safe. Have smoke detectors throughout the home. Each level should have one and each bedroom should have one. Check these detectors regularly and keep batteries (if battery-operated) fresh. A fire extinguisher can be a good idea. The Red Cross recommends being trained on how to use an extinguisher before using it. If you have windows that are two stories or higher, you should have an escape ladder (affiliate link). Having a plan will give your child the tools he/she needs to get out of the home safely in case of a fire.